Eloy Jimenez doesn't top the list, but it's looking like he'll beat Vladimir Guerrero to the majors. Scott White gives you his top 100 prospects. You know prospects, right? Young guys who've barely played in the majors, if at all? They're most applicable to dynasty leagues but fun for everyone, and if you're particularly observant, you can spot the ones with the best chance of contributing in redraft leagues. Here's how: I've assigned each player a 2019 Fantasy impact rating. It ranges from "pencil him in" to "don't count on it," and is pretty self explanatory. To qualify for this list, a player must still be rookie-eligible, meaning no more than 130 at-bats, 50 innings or 45 days on the active roster (September excluded). I'm a Fantasy writer, so this a Fantasy-inspired list, which basically means a greater emphasis on offensive potential and proximity to the majors. This emphasis is most noticeable in the final 10 names, which probably won't appear in any other top 100 list but are too close to contributing for Fantasy owners to ignore. Every one of these prospects (save maybe the back 10) is a significant asset in dynasty leagues, so try not to sweat the order too much. If you like No. 53 more than No. 48, you're not wrong. But enough yammering. Time to taste some tomorrow. The son of a hall of famer was basically Ted Williams in the minors last year and is the epitome of can't-miss, if not the best hitting prospect of my lifetime. An oblique injury guarantees he won't be up on Opening Day, but you could still have an impact bat by mid-to-late April. In a typical prospect class sans Guerrero, Jimenez is the one we're one-upping each other to get in mock drafts, himself combining uncommon contact skills with literal light-tower power. After signing him to a six-year deal, the White Sox have no financial excuses to keep him down at the start of the year. Though he initially struggled after an aggressive assignment to Double-A to open the year, Tatis hit .327 with a .972 OPS from May 1 on, offering even more fodder for those Manny Machado comparisons. Another bout with vertigo sidetracked Senzel's charge to the majors last May and a torn finger tendon dealt it a finishing blow a month later, but development is less the issue for him than finding a place to play. Maybe the outfield, where he's played plenty in the spring. He could be the Opening Day starter in center. A successful late-season call-up put to rest concerns that a hyperextended elbow had robbed Robles of power, but speed and batting average figure to be his more immediate contributions in his first full season. The fifth pick in the 2015 draft has progressed as quickly as anyone could have hoped, but the Astros insist on blocking him at every turn, not only short-changing his big-league promotion last summer but also signing Michael Brantley this winter. Whitley tested positive for a banned stimulant last offseason, sticking him with a 50-game suspension that messed up his timetable, but there's a Noah Syndergaard skill set and a clear path after the Astros lost 40 percent of their rotation to free agency. Reyes turned in the most impressive rehab assignment for any pitcher coming off Tommy John surgery ever ... and then tore his lat in his first start off the DL. But already knowing his skills translate to the bigs outweighs the injury history, right? You just might have to be patient, as Reyes looks to be slated for a bullpen role to start. The 15th pick in the 2016 draft used his year off for Tommy John surgery (in 2017) to beef up his bod, and the resulting Eloy Jimenez-level production should put him on a quick path to the big leagues. Though already a prized prospect as the 10th pick in the 2017 draft, Adell accelerated his development last year, particularly in the power department, and may soon garner Ronald Acuna comparisons if he takes as quickly to the upper minors. Seems like every move up the ladder has been two steps forward, one step back for Rodgers, but the scouts remain as high as ever on the former third overall pick who is of course poised to step into the most flattering park for hitters. Though most known for his screwball, it's just one of five pitches that, along with his plus command, should quickly vault Honeywell into the big league rotation, provided his recovery from Tommy John surgery goes smoothly. Bichette's exaggerated, high-torque swing has come to be viewed as more of an asset than a liability, earning him a pass for last year's decreased production, especially since he was so young for his level and especially since his other contributions remained strong. The No. 1 pick in 2017 may soon hold the No. 1 spot on this list, shaping up to be in two years what Fernando Tatis is now: a Manny Machado-in-waiting. The Tommy John returnee made arguably the biggest leap of any pitching prospect last year, combining a high-spin fastball with a plus-plus changeup for devastating results, and appears to be on the fast track to the majors. A strained rotator cuff could sideline him for the first couple months of the season, but he needed his innings preserved anyway. Kopech was indeed clocked at 105 mph once but finally learned the value of throwing a strike last year en route to a 1.84 ERA, 0.84 WHIP and 12.1 strikeouts per nine innings over his final seven minor-league starts. He'll have to put a pin in that progress, though, forfeiting 2019 to Tommy John surgery. Normally Rookie-ball participants are too far down the line, presenting too many potential outcomes, to crack a list as near-sighted as this one. But when a No. 1 international prospect makes a complete mockery of his peers, well, you can see where it's going. A liability even at first base, Alonso has to hit to have any sort of future in the majors. But that future looks bright based on the way he has hit, not only launching balls in the seats but doing so with exit velocities comparable to Giancarlo Stanton and Aaron Judge. Entering just his second professional season and blocked for the foreseeable future by Buster Posey, Bart doesn't have the immediate appeal of Francisco Mejia, but if there's any catcher you can trust with a long-term investment, he's the one, ensuring the Giants continue their tradition of uncommon production behind the plate whenever Posey does move on. The Indians gave up on Mejia because they couldn't commit to him behind the plate, and so far the Padres have been just as reluctant, holding tight to defensive whiz Austin Hedges. The position aches for a bat like his, though. Hiura has a penchant for line drives that may limit his ultimate power ceiling and a partially torn elbow ligament that may someday become full-blown, but his hit tool is so impressive that he's a near lock to matter in Fantasy on some level. The Braves took the cautious route when Soroka's shoulder started barking last summer, cutting short what was an impressive first stint in the majors, but he's still considered a high-floor pitching prospect who's well ahead of the game developmentally. The Rays haven't ditched the idea of using McKay as a two-way player, which may be holding him back at this point because it's clear from last year's strikeout-to-walk ratio what he's best suited to do. Imagine when he gives pitching his undivided attention. The first pick in last year's draft has the sort of power arsenal evaluators dream of, but it's all power right now, with his splitter basically functioning as his changeup. Still, there's enough diversity in the way his pitches break for him to move quickly. Recurring blister issues made for a disappointing first season of full-season ball, but Gore still had an eye-popping strikeout rate thanks to best-in-the-minors-type stuff. The ceiling is too evident for evaluators to grow disheartened. The Astros' embarrassment of prospect riches has led to a bottleneck at the top of the pipeline (see Tucker, Kyle), and Alvarez's limited defensive profile would seem to make him especially vulnerable. But as an OPS machine who handles same-handed pitchers, his bat will be higher-priority than most. Riley's strikeouts spiked again with his move up to Triple-A, but the Braves' expected 2020 third baseman has the sort of batted-ball profile to survive it, boasting a line-drive rate on par with Freddie Freeman and significant opposite-field pop. The prize of the Marlins' rebuild so far profiles similarly to Victor Robles, and if you ignore the 2017-18 season, when he was plagued by dengue fever, he hit .354 with a .939 OPS, 40 steals and more extra-base hits than strikeouts during his final season in Cuba. Power is sort of a must in today's game, which doesn't bode well for the contact-oriented Urias. But as hard as he hits the ball and as closely as his career parallels Jose Altuve's through the same age, he's someone to bet on. Though he took a step back in terms of power production last year, Trammell's 438-foot blast in the Futures Game served as a loud reminder of his potential, and he's one of the few rising power-speed threats without a crippling strikeout issue to overcome. Puk nearly locked up a job last spring before the Tommy John bug bit, and while he does have some control issues to overcome, his blazing 99-mph fastball is elevated to near unhittable status, a la Randy Johnson, thanks to the extension afforded his 6-foot-7 frame. Talk of him moving to the bullpen can cease and desist after a breakout 2018 in which he took a little off his fastball in the hope of improving command and still blew away the opposition, actually improving to a 1.72 ERA and 13.4 strikeouts per nine innings in 10 starts following his move up to Double-A. The Braves' highest draft pick during their rebuild is now arguably their top prospect (in a not-so-focused-on-2019 sort of way), outshining Soroka in pure stuff while closing the gap in pitching acumen and thriving when given the opportunity to pitch six innings at a time for the first time. A mechanical issue soured Keller's numbers last year, aided by his continuing efforts to develop a changeup, but his command and fastball/curveball combo are so good that he could probably thrive without one. A forearm issue delayed McKenzie's start to the season and possibly limited his effectiveness, not to mention furthering concerns that his rail-thin frame won't hold up to a starter's workload, but it was still an awfully impressive showing for a 20-year-old at Double-A. Enthusiasm for Sanchez so far exceeds the production, which is further complicated by the fact he's way behind in terms of building up innings (an elbow issue last year didn't help). But he belongs in the best-in-the-minors-type-stuff discussion, having drawn comparisons to Jose Fernandez — maybe that's why the Marlins insisted on including him in their J.T. Realmuto trade this spring. A prospect on technicality alone, Kikuchi profiles as more of a mid-rotation starter in the majors, drawing comparisons to Kenta Maeda, so he lacks the big ceiling and promises of longevity that dynasty owners crave. But if this list is for 2019 alone, he's probably in the top five. Seemingly anyone with a job is finding a way to pop 20 homers these days, so if Verdugo follows suit, his superior bat-on-ball schools could elevate him to stud status. It doesn't hurt that Yasiel Puig and Matt Kemp are now out of the picture. Ruiz makes a ton of contact with a high line-drive rate, so him hitting .268 for a full season is about as improbable as a 19-year-old catcher sticking at Double-A for a full season (which, yeah, he did). A return trip there should yield impressive results. Kieboom began the year hitting .298 with 11 homers and an .880 OPS in his half-season at Class A, so his final numbers would be splashier if he Nationals didn't promote him so aggressively. There's definite power here, along with sound strike-zone judgement. The most magical thing about Madrigal is how often he makes contact, which can be revolutionary in an era when power is so easily cultivated. But if his first taste of the minors is any indication, the fourth pick in last year's draft will need to figure out how to elevate the ball first. The fifth pick in the 2017 draft staggered through his first full professional season, encountering unexpected control issues while attempting to refine a changeup that would give him a true four-pitch arsenal. But he ended on a high note with a 2.40 ERA in his final 14 minor-league outings. Greene's stock has mostly fallen since the Reds took him second overall in 2017, though less because he's now pitching with UCL damage and more because his triple-digit fastball has proven to be surprisingly hittable, suggesting his delivery and secondary arsenal need serious work . Lowe rebounded from an 0-for-18 start to hit .273 with an .884 OPS in the final 37 games of his big-league debut, demonstrating the same power and patience that defined his time in the minors. There's still a chance, however, his questionable defensive profile could cost him a full-time role. Welker boasts an elite line-drive rate and has a knack for knocking the ball to the opposite field, which explains why he hits well over .300 at every stop. How those skills translate to the BABIP-inflating environment of Coors Field will be something to behold even if he remains just a middling power hitter. Though he still doesn't elevate the ball like a power hitter, Lux changed his swing path to avoid hitting so many grounders in 2018, and the resulting laser show sent dynasty owners rushing to the waiver wire for a rare shot at an offensive-minded shortstop (even if he's likely to wind up at second base). The Russell Martin trade means Jansen is the man, and he's basically turning back the clock to the sort of disciplined doubles machine Martin was in his Dodgers days (or maybe another Jonathan Lucroy type). Perhaps the most undervalued prospect on traditional (as in non-Fantasy) rank lists, Lowe shortened his swing so he could turn on inside fastballs while still using his exceptional pitch recognition to feast on offspeed stuff, transforming him from a polished but oft-overpowered hitter to one with few holes to exploit. A Cuban and Dominican Summer League standout, Robert's first season of full-season ball was a complete and utter disappointment but also marred by a thumb injury, which helps explain why he didn't hit a single home run despite an obvious power profile. He gets a pass. Last year's minor-league leader in walks is sometimes a little too patient, making him vulnerable to strikeouts, but his line-drive, all-fields approach lends itself to the sort of high BABIP needed to overcome that particular shortcoming, giving him a safer outlook than some publications would have you believe. The fifth pick last year had maybe the safest offensive profile of his draft class, and while his professional debut wasn't a rousing success, he showed enough power and patience not to lose any points for it. Buying into the fly-ball revolution while still in college appeared to give last year's 20th pick a leg up over others in his draft class, as did his advanced plate discipline and plate coverage. He's not afraid to use data to his advantage, which should make him a popular pick with statheads. Bohm's pro debut wasn't a welcome sight for Phillies fans, who still have PTSD from the Mickey Moniak misfire, but the scouting reports remain optimistic about the second overall pick, favoring him as much for his smarts and skills as his size and strength. The first high schooler selected in 2018 became the key piece in the Edwin Diaz this offseason, which shows what the Mariners think of his upside. Disciplined and athletic, Kelenic's comps range from Brandon Nimmo to Christian Yelich, but he's only at the start of what figures to be a long journey. The challenge in ranking Hampson comes from weighing immediate impact vs. long-term upside, but given the park he'll be calling home, the odds of him being an out-and-out bust are so low that I'm more inclined to take a glass-half-full approach for a player with special on-base skills and much-needed speed. Sanchez earns high marks for his bat skills, which may well translate to big, Carlos Gonzalez-type numbers. But seeing as they hasn't yet, the door is still open for more of a Nick Williams outcome, judging by the poor plate discipline. Pache's standout skill is his defense, which makes him easy to overrate on a Fantasy-specific list, but the athleticism required for that particular skill will sometimes spill into the offensive side of the game, particularly if the player is at least able to put the bat on the ball (see Lindor, Francisco). Some evaluators are positively enamored with Pache. If you do the math on O'Neill's minor-league pace, it comes out to 65 homers, but if you do the same for his major-league pace, it comes out to 303 strikeouts. The former number may be the less ridiculous of the two, judging by his history and tendencies, but the latter makes it difficult for the Cardinals to use him. The prize of the Manny Machado deal has become so polished as a hitter that he actually had more walks than strikeouts prior to the midseason trade, but the power has been slow to develop, casting doubts about whether he profiles as a big-league regular. Another undervalued Rays prospect whose breakthrough hasn't gotten enough attention from traditional rank lists, Brujan shows an exceptional batting eye and transcendent speed, which is enough to make him a dynasty darling. But he rarely strikes out and even showed power after a move up to high Class A, homering four times in 98 at-bats. The biggest power hitter in the 2018 draft certainly delivered on those expectations, homering 17 times in his first 64 pro games. But he hit just .202 with an exorbitant strikeout rate after being promoted out of the Rookie league and obviously still has a ways to go. The Marlins made all the prospect hounds' heads explode when they dealt this statistical curiosity for Fernando Rodney in a foolhardy attempt at contention a couple years ago. H quickly reminded us why in his first year back from Tommy John surgery, retiring hitters with staggering efficiency despite lacking a true breaking ball. A sleep apnea diagnosis last offseason led to a 10 mph jump in velocity for James, not to mention a sudden arrival to the prospect scene and perhaps the big-league rotation, his years of sleeplessness actually helping his case now by having forced him to refine his secondary arsenal just to survive. Though he was mostly regarded as more of a project than a prospect, Toussaint's GIF-worthy curveball has long attracted interest, and he took his clearest steps toward getting the most of it last year, throwing just enough strikes to keep runs off the board and earn a place in the Braves' rotation plans. It's a deliberate lowball ranking for Sheffield, who indeed had a special fastball. But everything from his poor efficiency to his lack of a true offspeed pitch to his smallish stature leads me to believe his future is in relief, in which case we can only hope he's closing. Having Craig Biggio's son on the same team as Vladimir Guerrero's and Dante Bichette's started out as just an amusing footnote, but then Cavan Biggio emerged as a prospect in his own right, lowering his hands to create more loft in his swing and continuing to show uncommon plate discipline. Stewart doesn't place nearly as high on traditional prospect lists because he's such a liability on defense, but the rebuilding Tigers have no reason not to play him and did down the stretch last season, when he demonstrated Carlos Santana-like patience and power. Already a discipline hitter, Murphy's power broke through in a bigger way than you might assume at first glance given that he missed six weeks with a broken hand and was playing half his games in a pitcher's environment. And he's such a standout defensively that you know he's sticking at catcher. Though they're 24 spots apart in the rankings, the gap between Nevin and Colton Welker isn't so great, with the latter profiling as a slightly better bet for batting average. But the son of former first overall pick Phil Nevin knows the strike zone and has enough power to become an All-Star at Coors Field. A top-five talent who fell to 18th in the draft, Singer was the Baseball America College Pitcher of the Year and should move fast. He has only two pitches right now, lacking a changeup, but his delivery gives plenty of movement to both. Manning's NBA bloodlines — his dad Rich was a center — gives him long limbs that make for excellent extension but also leave him vulnerable to mechanical issues, which leads to the typical high-strikeout, high-walk profile. Last year was a big leap forward, though. Graterol, like fellow Twins prospect Alex Kirilloff, used his time off for Tommy John surgery in 2017 to bulk up, and the result was a double-digit jump in fastball. He's like a harder-throwing version of Jose Berrios, who he deliberately tries to model. Garcia's hitting instincts — namely a simple swing and quick reflexes — have him verging on the upper levels of the minors even as a teenager, so you can forgive the lack of home run power to this point. Considered teachable with a high baseball IQ, his upside might be somewhere in the neighborhood of Robinson Cano. Hernandez is still transitioning from the infield and will need to make quick progress defensively to avoid holding back his bat, which figures to be at least on the level of a Salvador Perez and maybe even approaching Gary Sanchez production. Lavigne is awfully young to be confined to first base, limiting his path in a system loaded with corner infielders, but he's showing signs of being the best of all of them with incredible strike-zone judgment and big power. You could see him developing into a Paul Goldschmidt or Joey Votto type at Coors Field. A reliable fielder with a strong contact profile, the one area where Hayes has consistently fallen short is power hitting, but he took a notable step forward in that area last year. It manifested mostly at doubles, but largely because of an unfavorable home park, as the splits reflect. Drafted 10th overall last year, Swaggerty is more of a high-floor than high-ceiling prospect, with comps ranging anywhere from Austin Meadows to Andrew Benintendi, which means it's not totally clear if he'll offer enough power to be an impact Fantasy player. Florial's 2018 did its best to squelch the enthusiasm generated by his breakthrough 2017, but he still reached base at a .377 clip and has a reasonable excuse for the drop in production, seeing as he broke his hamate bone in May. After he was touted as the prize of the Braves' rebuild, personal tragedy took Gohara's focus off baseball last year, compromising his efforts to maintain a playable physique. But slimming down this winter will hopefully allow him to regain his high-90s fastball and wicked slider. For someone just drafted out of high school, Liberatore demonstrates an incredible feel for pitching that will take him as far as the development of his stuff allows. A low-90s fastball for a 19-year-old lefty is a good starting point, as is a deceptive, Cole Hamels-like changeup. Varsho is athletic for a catcher, showing surprising aptitude for stealing bases without any other real shortcomings offensively. But if his defense requires him to move out from behind the plate to outfield or second base, there's a chance his bat won't quite measure up. Smith's studious nature allows his skills to play up, and there's a strong power profile to begin with. Whether or not the improved contact rate and base-stealing prowess he demonstrated last year translate to the upper levels will go a long way toward determining his ultimate role in the majors. Dalbec's upside began to take shape with a midseason power explosion that saw him smack 17 homers with a 1.049 OPS in his final 54 games, and that one tool may be enough to carry him. But excessive swing-and-miss tendencies could doom him against big-league pitchers. Solak can take a walk, run a little, has some power and may well have a role in the majors soon, but his lack of a standout skill could limit that role in an organization brimming with middle infielders, making him more of a curiosity than a centerpiece in dynasty leagues. A PED suspension sidelined Chavis for the first half of 2018, understandably calling his achievements into question, but he picked up right where he left off and still profiles as a safe if unspectacular source of power. Having already moved off shortstop, Mountcastle doesn't seem up to the task of playing third base either, which puts pressure on his bat to carry him to Fantasy prominence. And while that side of the game comes pretty easily for him, he may fall a little short power-wise if relegated to first base or DH. Though he's not as hyped, Beer's profile isn't too dissimilar to that of Kyle Schwarber, with all the good and bad. True, his plus batting eye and easy power could take him down more of a Max Muncy path, but Beer is limited defensively and a possible platoon candidate at the top level. Chisholm's raw tools began to take shape in 2018, revealing a possible 20-20 man at a historically defensive-minded position, but he'll need to make more contact for it to hold up at the higher levels. The former Marlins first-rounder wowed with his production for the first time last year, but try as he did in left field, it's not a viable option for the portly plodder. He might find himself in Daniel Vogelbach purgatory with Eric Hosmer signed long-term. 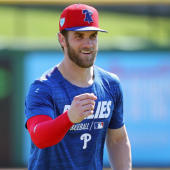 Despite bouncing back to the form that made him one of the minors' top bat-missers in 2016 and turning in a couple of 10-strikeout efforts in the majors last September, Reid-Foley has gotten only a lukewarm response from scouts, possibly because his fastball command and secondary arsenal have been so inconsistent. After a 2017 when it all seemed a little too easy, Hays made it hard for himself last year by trying to yank everything out of the park, perhaps out of frustration that a balky shoulder prevented him from winning the starting right field job last spring, but he has come roaring back this spring and may be a post-hype sleeper. The Giants prospect who never has stayed healthy enough in his third year with the Yankees to earn a big-league promotion, dazzling with three plus pitches and elite strikeout-to-walk ratio. But an injury, this time to his shoulder, derailed him again, casting doubt over whether he's best suited as a starter. After a 2017 in which he delivered the lowest ERA for any minor-leaguer since Justin Verlander in 2005, Duplantier now faces questions about his durability, with some wondering whether his funky delivery contributed to his elbow tendinitis last year. He was still good, but the strikeouts and walks both went the wrong direction. Most Gordon owners have had him since the Twins drafted him fifth overall in 2014, his climb being a slow and deliberate one. Even though his 2018 was nothing to write home about, you're too invested at this point to give up on a player who offers above-average contact skills and speed at a premium position. An eight-start stretch last summer in which he put together a 2.24 ERA and 11.4 strikeouts per nine innings moved Wilson to the front of the Braves' procession of pitching prospects, but he made only one start before ceding to Toussaint, mostly because he's a little too dependent on his fastball right now. Rooker's 2018 was a roller-coaster ride that peaked in the middle before ending with a steep drop that pretty well dampened the enthusiasm from his 2017 debut when he beat up on younger competition. He still offers plenty of power, but he'll need to improve his all-around bat skills and fast. Allen is the one of those stats-over-stuff pitching prospects who doesn't place high on traditional lists, and it's true he doesn't have ace upside. But he has four pitches, understands how to attack hitters and is efficient enough to handle a starter's workload, which is a skill in its own right these days. Social media's favorite player is so bizarrely out of place in today's game, putting the ball in play virtually every time he comes to the plate, that it's fair to say the Twins don't quite know what to do with him. His catcher eligibility has Fantasy owners rooting for him even if a utility role is probably his best-case scenario. Valdez made quick work of the minors, not having to spend a lot of time building a secondary arsenal, because what he has is already so functional, his sinking fastball and sweeping curveball piling up groundballs at a Dallas Keuchel-like rate. But will he throw enough strikes and miss enough bats? Tellez is one of those big-bodied players who profiles best at DH and pretty much has to hit to have any hope of a big-league job. For most of his minor-league career he did just that. Even if his production faded some at the higher levels, he looked good enough in a late-season audition to at least play a role for a rebuilding team.